On Friday morning the tops of the trees near us began tossing their heads to and fro. A trip to the water seemed like a good idea. Across the strait clouds and mist swirled around the mountains of the Olympic Peninsula. At Clover Point waves splintered against the rocks with satisfying crashes then trickled back into the sea. The restless water surged this way, then that, never ceasing. Great flocks of gulls wheeled overhead, or faced into the wind and barely moved, held aloft by the forces of air. Their thin screams were whisked into nothingness by the gusts. The fluidity of flight - wings curving and tail feathers fanned. The wind tangled my hair and blew sea mist onto my face. Oh, but it was exhilarating. Autumn's wildness is catching - I longed to lift off and catch the wind like the gulls. Linking to Mosaic Monday hosted by Judith of Lavender Cottage. Wouldn't it be great to fly over the crashing waves and ride on the wind! You are getting SO GOOD with that camera! Love the seagull wings! Gorgeous view of the coastline.. 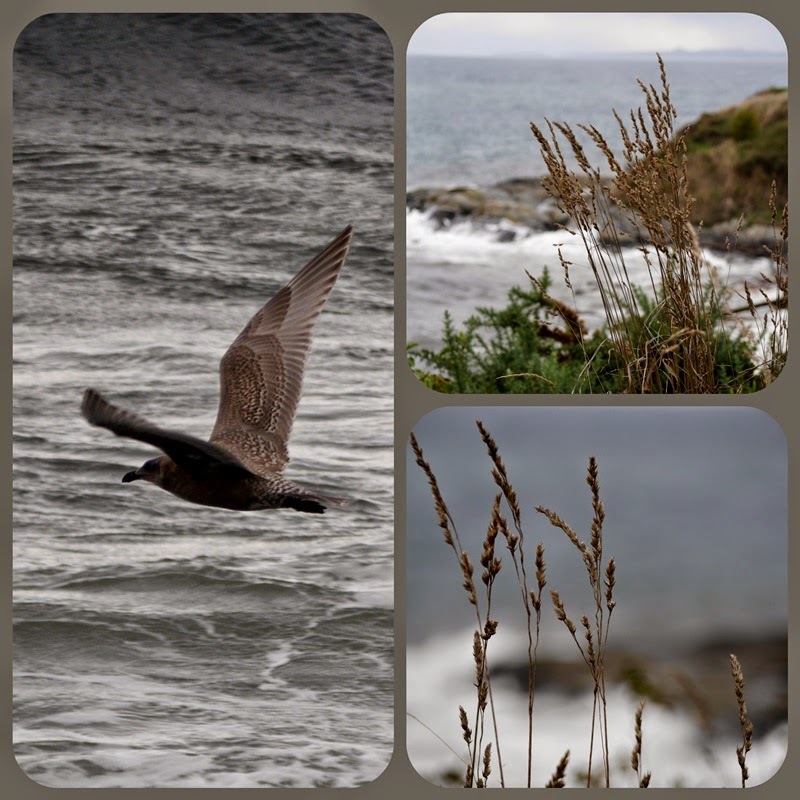 I love the gulls in flight.. Lovely images, thanks for sharing your trip! Have a happy new week! I feel the wildness of it all. Exhilarating! I can just imagine the sounds ... the wind, the waves, the gulls. Great post! Absolutely stunning photos - and I love a good adventure on the ocean in a storm. We've had the same wind and it is really picking up - I suspect that we'll both have rain before long. But today was gloriously sunny - and very windy - and we found the Snow Geese in Skagit County - some flying up into the wind and when they did, they let it push them backwards for a long way before they flapped their wings to make progress - it was magical. Great photos as usual, I could feel that wind blowing in my face. Your photos of the gulls are beautiful Lorrie. I never have much luck with birds! I love their wing span and the markings they display! These would have been great photos for Donna's "movement" photo challenge! I love he patterns that the wind creates on the water. Birds here have been very disturbed lately, flying round and round above us. I think it's the wind, and the promise of even more storm. Oh to be living close to the sea again - I miss it so much, especially when viewing scenes such as you enjoyed on that blustery day. Lovely pics and descriptions of your time in the wind Lorrie. We awoke to our first chilly morning of the season - 40F now but should warm up to 73F this afternoon. I think we'll shoot for the State Fair later this morning, just spend a few hours looking around the exhibits - should be a perfect day for that. one for us all. Seize the moments as I know you always do. Poetic and lovely. I can smell the ocean air. Your photos and your words work together to recreate these powerful moments for us! Beautiful! I had to go put a sweater on mid way through this! :) I could FEEL the wind and spray! Not only are photos and mosaics wonderful, but so is your prose with such nice descriptiive language, which makes your photos really live. You live in a lovely place. We've had some wonderful wind this weekend, haven't we? The snow geese we flying sideways over Richmond...lol. Lorrie, you managed to beautifully capture in stillness, the struggle of the seagulls' flight, on a grey, windy day, above the sea. So enjoyed your description of this blustery voyage. Oh, Lorrie, your photos are wonderful! I felt like I was there with you! You captured the wind well in these shots, Lorrie! Beautiful! Your photos and wonderful descriptions made me feel I was right there! Amazing shots you captured, Lorrie. More than once I have wished to experience what it must feel like to be a bird in flight. Oh my gosh Lorrie, these pictures are amazing!! I love the mountains in the first picture!! My husband and I took a photography class about three years ago, and the instructor said that birds are hard to photograph. You captured these gulls beautifully. I've seen seagulls all my life, but I never knew their faces had speckles like these. This is one of my favorite posts that you've done! Oh Lori ,I'm loving this stormy day. Your gull shots are outstanding. I can almost feel the wind ... What a great series. I love sunny days at the beach...but stormy ones, in ways, are even better! Beautiful photos Lorrie! It looks beautiful and very atmospheric......I love stormy seas! You are quite gifted as taking shots of flying birds and waves isn't as easy as it may seem....stunning images...you can feel the wild wind! I love your photos and description of the wild day you experienced. So beautiful! The pics of the gulls are beautiful and I often notice how they just sit on the wind currants and barely move. We have stormy weather coming for the next few days. You are getting beter and beter with your camera and your writing is like poet. I use to read out laud the text. It's good practice for me. And I learn something new every each time. Those Gull flight images are wonderful Lorrie. This post is exhilarating and your photos are amazing. Such energy and motion. Well captured!